This 'conversation' between artworks was part of the first stage of the Gallery's exhibition Conversations through the Asian collections. The two works are no longer on display in stage two. Yamamoto’s screen painting Whose clothes? is a witty and elegant vision of the layering of cultures in present-day Japan. Renowned for his idiosyncratic approach to nihonga or Japanese-style painting, Yamamoto uses techniques and motifs from the Edo period (1615–1868). Here they include the tarashikomi or ‘pooled ink’ technique and the decorative water-swirl and water wheel motifs on the garments. 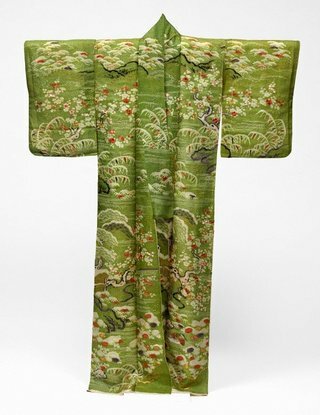 He also echoes traditional Tagasode or ‘Whose sleeves?’ screens, which featured women’s kimono (kosode) draped over lacquered clothing racks alongside other objects connected with beautiful women like purses or amulets. Such scenes evoked the presence of the owner through her possessions. Yamamoto re-interprets this classical theme in light of contemporary fashion. 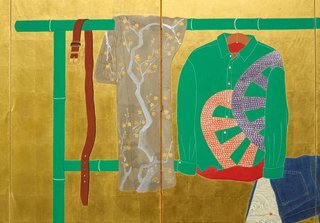 The garments on the racks conjure up the image of a young man and the tea tray hints at his hobby, while the types of clothing attest to the ‘Americanisation’ that Japanese culture has undergone since the end of World War II. Yamamoto's screening painting is presented beside traditional clothing and accessories, including a changing display of kosode such as this one with a design of mandarin ducks. What season is represented on the kosode? How can you tell? Draw a set of your own clothes and how you hang them in your room. Imagine who would wear these clothes and how they would be worn. Sketch your ideas.